When decorating your yacht, furniture is the foremost thought in most people’s minds. Of course the furniture you choose must be practical; sturdy, durable and able to withstand movement and changes in temperature, as well as moisture. But appearances are a prime consideration as well. A yacht is somewhere people come to relax, get away from it all and feel absolutely comfortable. 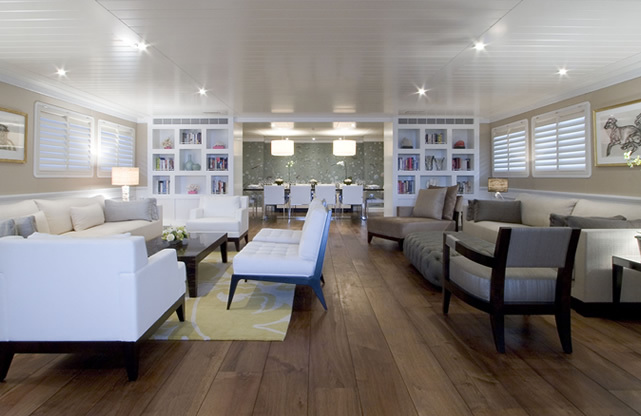 So the style of the yacht furniture must suit your personal tastes as much as possible. Buying the first pieces you see is not advisable; take some time to think about what will both feel and look good in your home away from home. Firstly, have a look at the size of the yacht’s interior. Whilst your initial choice might be, for example, a large wooden table and chair dining set, this could be an impractical choice for a smaller sized yacht, where space needs to be optimized as much as possible. Choose light coloured furniture to create a more spacious appearance; many yachts can be dark and small inside, so purchasing light coloured pieces will make a significant difference in the overall look of the interior. Yacht furniture usually needs to be fixed into place to avoid it being moved around when sailing on rough waters. Most pieces of furniture come with fixtures to attach the furniture to the walls or floors of the room. However if you have specialist or personalised furniture, you may have to either have a professional attach some fixtures or do it yourself if you are used to at home DIY projects. Although the interior of a yacht is generally protected from outdoor weather conditions, do bear in mind that over time, small exposures to sea salt and the wind can damage your furniture, as wear and tear accumulates over a few years. Treating your furniture with protective agents may not seem like a priority at first, when decorating and design are the main things on your mind, but if you are spending a large amount of money on new yacht furniture, then having it treated correctly is like an investment for the future. Make sure to regularly examine your furniture for evidence of damage due to sea, sun and wind exposure, as these small damages are often much more straight forward to fix than the more severe damages that can occur years down the line. A yacht is, for many, the very definition of a luxury item. So when decorating yours, materials such as teak wood are often an excellent choice for creating that luxurious, elegant appearance. Teak is also a very durable material. Matching the different pieces of furniture is also a good idea as the interior will have a more uniform appearance. The basic types of furniture you will most likely need include a dining set for meals, some deck chairs for lounging outdoors in the sun and perhaps some low book shelves and a coffee table. If there is room, an armchair is a great addition to the interior of a yacht, as it is the perfect place to relax indoors if the weather becomes colder.